The World Health Organization projects diabetes prevalence worldwide to be at 4.4% in 2030 compared to 2.8% in the year 2000. These alarming predictions come amid vigorous efforts in diabetes research which have failed so far to deliver effective therapies. Our incomplete understanding of the pathogenesis of diabetes is likely to contribute to the “disconnect” between our research efforts and their translation into successful therapies. Technically, studying the pathophysiology of the pancreatic islets is hindered by the anatomical location of the pancreas, which is deeply embedded in the body, and by lack of experimental tools that enable comprehensive interrogation of the pancreatic islets with sufficient resolution in the context of the natural in vivo environment non-invasively and longitudinally. Emerging evidence also indicates that challenges in successful translation of findings in animal models to the human setting are complicated by some inherent structural and functional differences between the mouse and human islets. In this review, we briefly describe the advantages and shortcomings of existing intravital imaging approaches used to study the pancreatic islet biology in vivo, and we contrast such techniques with a recently established intravital approach using pancreatic islet transplantation into the anterior chamber of the eye. We also provide a summary of recent structure-function studies in the human pancreas to reveal distinctive features of human islets compared with mouse islets. We finally touch on a recently renewed discussion of the validity of animal models in studying human health and disease, and we highlight the potential utility of “humanized” animal models in studying different aspects of human islet biology and improving our understanding of diabetes. Diabetes is reaching pandemic proportions in the United States and around the world. Addressing this global health problem will require a complex multifaceted approach on the individual, societal, cultural, and political levels. Part of this effort also includes a serious investment in biomedical research to better understand the mechanisms underlying the pathophysiology of this devastating condition and its associated complications. A great deal of research has been invested in this area and overwhelming evidence implicates both peripheral insulin resistance and functional derangement of the insulin-producing beta cell in the islets of Langerhans in the pathogenesis of type 2 diabetes. While insulin resistance is a likely consequence of “normal” aging, most individuals without an underlying defect in beta cells maintain glucose homeostasis later in life 1 , 2. Thus, beta cells are capable of coping with insulin resistance so long their function is not hindered by inherent defects that contribute to diabetes predispositions 3 , 4. The beta cell is also the primary target of autoimmune attack in type 1 diabetes. Therefore, being able to directly monitor and study the pancreatic islets is essential to fully understand the human islet physiology in health and disease. The pancreas is embedded deeply within the abdominal cavity and the pancreatic islets, which constitute the endocrine pancreas, are scattered throughout the “sea” of the exocrine pancreas. 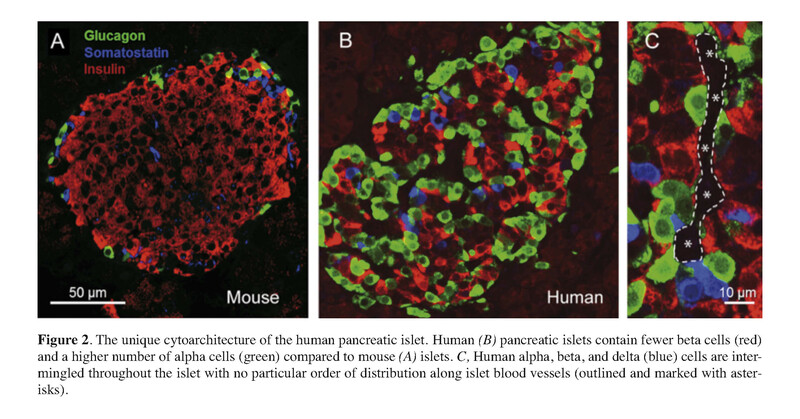 Both, the anatomical location of the pancreas and the sparse islet distribution have imposed major technical restrictions that have limited direct observation and investigation of the pancreatic islets under in vivo conditions, not only in humans but also in animals. Adding to the challenge is emerging evidence showing structural and functional characteristics that are unique to the human islets in comparison to rodent islets, which have been the cornerstone in our base of knowledge about pancreatic islets. These differences are likely to account for the apparent inconsistencies between outcomes of studies performed in animals versus humans. In this review, we briefly describe existing imaging approaches aimed at studying different aspects of the pancreatic islet biology in the context of the natural in vivo environment, and we highlight a recent experimental approach using islet transplantation into the anterior chamber of the mouse eye as a valuable tool to study human islet biology with single cell resolution non-invasively and longitudinally. We also summarize recent findings in the human pancreas showing unique structural and functional features of the human islet. To circumvent the limitations associated with the anatomical location and sparse distribution of the islets of Langerhans in the native pancreas, in vitro and ex vivo studies using isolated live islets or pancreatic slices, as well as fixed sections of pancreatic tissue have been extensively used to investigate different aspects of islet biology. These studies have contributed and will continue to contribute significantly to our understanding of the physiology and pathophysiology of pancreatic islets. However, inherent limitations of in vitro and ex vivo studies in faithfully and fully recapitulating all aspects of the natural in vivo environment have always inspired and motivated development of intravital approaches to enable studying the pancreatic islets in their native environment under living conditions. Intravital approaches such as magnetic resonance imaging (MRI), positron emission tomography (PET), computed tomography (CT/CAT), and ultrasound or bioluminescence imaging have enabled non-invasive visualization of organs/tissues deep within the body including pancreatic islets 5 , 6 , 7 , 8. However, even with the use of high contrast materials or tissue-specific luminescence, these techniques cannot be used for single cell imaging due to high background signals and inherent low spatial resolution 9. Therefore, most applications of such techniques in the context of islet biology have primarily been to assess pancreatic islet survival during diabetes development or after transplantation either by relying on indirect features such as changes in the pancreatic vasculature or by measuring macroscopic parameters such as total islet mass 10. With the advent of two-photon or multiphoton microscopy 11, high resolution imaging of different tissues became possible in living animals 12, but the need for invasive surgical access to the pancreas to directly visualize pancreatic islets 13 , 14 , 15 or to image islets transplanted elsewhere in the body (e.g., under kidney capsule) 16 , 17 limits the number of repeated imaging sessions needed to study the same islets over extended periods of time. Not being able to study changes in the same individual islets may be especially limiting when investigating chronic, slow progressing conditions such as type 2 diabetes. In an effort to be less invasive, other in vivo experimental approaches have been developed to enable high resolution imaging of target tissues non-invasively. These include “window chamber devices” where a chamber with a transparent window is surgically implanted into the skin at different locations (e.g., dorsal or ear skin, mammary fat pad, etc.) on the animal to allow direct visualization of target tissues 18 , 19 , 20 , 21. The target tissue can be either directly underneath the window of the device or transplanted inside its chamber to provide a form of barrier to protect from immune attack. Window chamber devices clearly enable non-invasive imaging, but implantation of the device itself requires considerably invasive surgery. Moreover, such devices may not be suitable for longitudinal studies spanning several weeks or months due to compromised physical integrity of currently available devices during such extended periods after implantation 22. Along the efforts of being less invasive during intravital interrogation of the pancreatic islet, we recently demonstrated that by combining high resolution in vivo imaging with transplantation of pancreatic islets into the anterior chamber of the mouse eye, we were able to study different aspects of the islet biology non-invasively and longitudinally 23 , 24 , 25 , 26 , 27. Islet introduction into the anterior chamber of the eye is minimally invasive (Figure 1) 28 given the location of the site, the avascular nature of the cornea, and the immunological properties of this site 29 , 30 , 31. Importantly, pancreatic islets transplanted into the anterior chamber of the eye engraft on top of the iris, become revascularized, and convey significant glycemic control in diabetic recipient mice or non-human primates 32 , 33 , 34. Blood vessels within intraocular islet grafts also have ultra-structural features (i.e., capillary diameter and fenestration) comparable to those in islet vessels in the native pancreas (Nyqvist D, Speier S, Rodriguez-Diaz R, Molano RD, Lipovsek S, Rupnik M, Dicker A, Ilegems E, Zahr-Akrawi E, Molina J, Lopez-Cabeza M, Villate S, Abdulreda MH, Ricordi C, Caicedo A, Pileggi A, Berggren PO. Donor islet endothelial cells in pancreatic islet revascularization. Diabetes 2011; 60: 2571-2577.). Because of these and other features, intraocular transplantation has been used to study a variety of animal and human tissues 35 , 36 , 37. We have transplanted isolated human pancreatic islets into the anterior chamber of immune compromised mice where non-invasive study of the human islet biology was performed under living conditions for extended periods of time 38. This has enabled us to circumvent major technical limitations in studying human islet biology in vivo, which is otherwise impossible in human subjects. Being able to directly study human islets under physiologically relevant conditions is especially important in light of emerging evidence showing significant structural and function differences between mouse and human pancreatic islets. Rodent pancreatic islets have been the “work horses” in islet research and have provided critical knowledge about islet biology. However, as availability of human pancreatic islets and their use in research have become more common, anecdotal evidence about certain distinctive features of mouse and human islets has started to emerge. In the middle of the last decade, a landmark study by Brissova et al. and another by Cabrera and colleagues provided unequivocal evidence on the unique cytoarchitecture of the human islet with direct consequences on islet function 39 , 40. In contrast to the prevalent stereotypical view of the mouse islet with alpha and delta cells surrounding the “core” of beta cells which typically account for up to 80% of the islet cells, the human pancreatic islet contains considerably fewer beta cells (≤ 50%) and a larger number of alpha cells (≥ 40%). Human alpha, beta, and delta cells are intermingled throughout the islet with no particular order of distribution along the islet blood vessels (Figure 2). This cellular arrangement likely favors paracrine interactions among the different neighboring islet cells. It also suggests that the islet microcirculation may not necessarily dictate a specific hierarchy of one endocrine cell over another during regulation of islet function 41 , 42 , 43. The intermingled distribution of human endocrine cells also reduces the widespread electrical coupling between beta cells, which is otherwise typically the case in mouse beta cells 44 , 45. Diminished electrical coupling is also consistent with lack of synchronization of cytoplasmic free calcium ([Ca2+]i) oscillations in beta cells throughout the whole human islet. Moreover, in human islets ≥ 90% of alpha and beta cells have heterotypic contacts with neighboring islet cells of another type. Together, these findings suggest a prevalent role for autocrine and paracrine signaling among the different endocrine cells in the regulation of the human islet function and glucose homeostasis. Maintenance of glucose homeostasis requires an intricate cross-talk among the different islet cells and complex coordination of the endocrine cell actions on peripheral target tissues (i.e., liver, muscle, and fat). Hormones released by the different islet cells have different effects in the target tissues. Insulin released from beta cells in response to increased blood sugar levels (hyperglycemia) after food ingestion leads to glucose uptake from the circulation. Glucagon in turn is released in response to low plasma glucose levels (hypoglycemia) leading to restoration of normal blood sugar levels through neoglucogenesis and glycogenolysis primarily in the liver and muscles. Islet hormones, in addition to other co-released factors (e.g., ATP, GABA, glutamate, acetylcholine, and Zn2+), also have direct effects on the overall islet function through autocrine and paracrine signaling onto neighboring islet cells. We have shown that glutamate released together with glucagon acts as a positive autocrine factor on the alpha cell 46. Glutamate primes the alpha cell and potentiates glucagon release in response to small fluctuations in blood glucose. We also showed that glutamate excitatory effects are mediated through ionotropic glutamate receptors (iGluRs) of the AMPA/kainate type (Figure 3), which are expressed on the surface of alpha cells, but not beta cells, in the human islet. These findings essentially elucidated the mechanism(s) of glutamate action on the function of the human islet, as previous reports in rats have suggested differing effects of glutamate on alpha cell function 47 , 48. 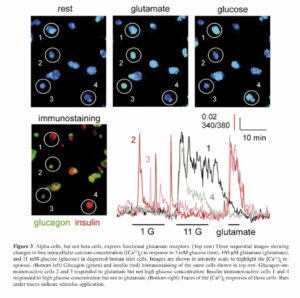 The priming effect of glutamate on the alpha cell likely contributes to the tightly regulated glucose homeostasis in humans to prevent severe life-threatening hypoglycemia. Motivated by previous studies in rodent islets reporting on conflicting paracrine effects of extracellular ATP on the function of beta cells, we investigated the role of ATP in human islet function. ATP is released together with insulin from beta cells, and studies have shown both excitatory and inhibitory effects of ATP on insulin release from mouse and rat islets 49 , 50 , 51. In human islets, however, purinergic agonists were reported to have an excitatory effect on the beta cell and insulin release 52, but the specific purinergic receptors mediating this effect were not identified 53. Using different techniques, we demonstrated that the ATP-gated purinergic receptor P2X3 is the primary mediator of the action of extracellular ATP on the beta cell of the human islet 54. We also showed that ATP acts in a positive autocrine feedback loop to sensitize the beta cell and potentiate insulin release in response to subsequent stimulation by high glucose concentration (Figure 4). Importantly, our findings demonstrated that ATP may be released from insulin granules at low glucose concentration without insulin secretion, likely through kiss-and-run release events without full dilation of the fusion pore 55 , 56. ATP release preceding full depolarization of the beta cell likely primes beta cells to mount a robust response upon exposure to high glucose. This is consistent with stringent regulation of the robustly maintained glycemia under normal conditions in healthy individuals. Mammals have a surprising capability to maintain constant blood sugar levels. Whatever the reasons (e.g., evolutionary, diet, body size, etc. ), animals including humans have a “set point” for blood glucose level that, although may be different from one species to another, is kept within strikingly narrow ranges under normal conditions. Maintenance of such level of stringency would likely require various check-points to ensure adequate glycemic control at all times. Hence, in addition to the different autocrine and paracrine mechanisms which are crucial for regulating the pancreatic islet function, the autonomic nervous system has also been shown to play an important role in modulating the function of the endocrine pancreas 57 , 58. The autonomic nervous system consists of sympathetic and parasympathetic axons that innervate vital organs and critically contribute to maintaining overall organism homeostasis. In the pancreas, the autonomic nervous system couples glucose metabolism to the behavior to ensure availability of plasma glucose as fuel for vital functions under different conditions (e.g., digestion, fight-or-flight response, etc.). On the one hand, sympathetic nervous input to the pancreatic islet stimulates glucagon release and inhibits insulin secretion. On the other hand, parasympathetic input has been shown to stimulate release of both glucagon and insulin, but that of glucagon to a lesser degree 59. It has thus been well established that pancreatic islets receive sympathetic, parasympathetic, and sensory nervous input, and the assumption has been that such input is mediated by direct innervation of the islet endocrine cells 60 , 61. Existing knowledge, however, about the role of innervation in islet function has been primarily based on studies using rodent islets, and there are only a handful of studies that examined, though non-comprehensively, islet innervation in human pancreatic tissue 62 , 63 , 64. As a result, the general wisdom has been that the human islet has similar innervation patterns as the mouse islet. Inspired by our previous observations about the distinctive aspects of the human islet anatomy and physiology when compared with mouse islets, we investigated in detail the autonomic innervation patterns of the human islet using high-quality fixed pancreatic tissue from multiple cadaveric donors 65. Surprisingly, our findings revealed stark differences in the patterns of autonomic innervation of mouse and human islets. Mouse islets were densely innervated by sympathetic nerve fibers, where sympathetic axons primarily contacted alpha and delta cells (Figure 5). In human islets, however, fewer sympathetic nerve fibers were found. Sympathetic axons typically penetrated the human islets along blood vessels and preferentially localized near vascular contractile elements, which were frequently found throughout the human islets in association with the islet blood vessels. Direct sympathetic innervation of vascular smooth muscles within the islets suggests local regulation of blood flow within segregated areas of the islet, adding to the complexity of human islet function regulation. This is in sharp contrast to mouse islets where vascular smooth muscles are typically found in association with “feeding” arterioles, where more upstream regulation of blood flow into the whole islet is likely to take place. 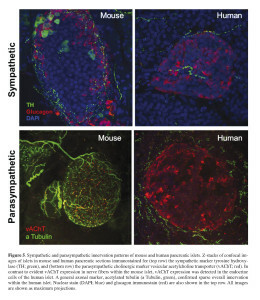 Consistent with a distinct pattern of sympathetic innervation within the human islets, parasympathetic nerve fibers were infrequently found within the human islet indicating scarce direct parasympathetic innervation of human endocrine cells (Figure 5). This is in sharp contrast to mouse islets where parasympathetic fibers were found to directly innervate alpha and beta cells. Parasympathetic nerve fibers release the neurotransmitter acetylcholine which has been shown to have a major role in the function of pancreatic beta cells 66. Acetylcholine stimulates the beta cell and potentiates insulin release by enhancing [Ca2+]i signaling through protein kinase C and inositol phosphate production 67 , 68 , 69. Indications about the role of acetylcholine in the function of the endocrine pancreas also came through observations on the cephalic phase of insulin release 70. The cephalic phase is defined as the initial insulin secretion mediated by the autonomic nervous system during meals to prime the beta cells for the impending increase in blood glucose levels after food ingestion. The conclusions about the importance of the cephalic phase of insulin release have been primarily based on studies in different mammals including humans 71 , 72 , 73 , 74. Hence, based on studies in rodent islets the assumption for humans has been that parasympathetic cholinergic fibers directly innervate the beta cells. However, our recent findings in human pancreatic tissue have shown scant direct parasympathetic innervation of the human islet endocrine cells 75. And given the well-documented role of acetylcholine in islet function and our own functional studies demonstrating its role in insulin release from human islets 76, our recent findings showing limited parasympathetic innervation within human islets suggested an alternative endogenous source of acetylcholine. Indeed, we found that human alpha cells express essential components of the machinery necessary for acetylcholine transport into secretory compartments 77. Detailed immunostaining analysis in human pancreatic tissue revealed that the majority (~80%) of islet cells that stain positive for vesicular acetylcholine transporter (vAChT) are also positive for glucagon; whereas the remaining vAChT-positive islet cells were only positive for somatostatin and not insulin. These data suggest that alpha cells, and to a lesser degree delta cells, are the likely primary source of endogenously released acetylcholine in human islets. Further detailed analysis also showed that vAChT staining in human alpha cells did not overlap with glucagon, further suggesting that acetylcholine may be packaged in different compartments and released with and without glucagon. In sharp contrast, studies in mouse islets showed exclusive expression of vAChT in islet nerve fibers with direct innervation of endocrine cells, consistent with reported direct effects of parasympathetic innervation on the function of mouse islets 78 , 79. Furthermore, additional functional studies in isolated and cultured primary human islets, in absence of any direct or indirect effects of innervation, showed that human islets release acetylcholine upon stimulation with alpha-cell specific stimuli such as kainate or lowering of glucose concentration 80 , 81 , 82. Importantly, endogenously released acetylcholine from the alpha cells increased basal insulin secretion at low glucose concentration. Moreover, alternating between low and high glucose concentrations (3 and 11 mM) while inhibiting acetylcholine degradation resulted in “buildup” of endogenously released acetylcholine from alpha cells in isolated islets which led to increased insulin secretion during the repeated stimulation of beta cells. Conversely, specific blockade of the muscarinic M3 receptor reduced insulin secretion at low (basal release) and high (stimulated) glucose concentrations. These findings thus demonstrate that endogenously released acetylcholine from alpha cells primes neighboring beta cells through paracrine signaling to potentiate insulin release upon stimulation with high glucose in human islets. Diabetes incidence is reaching disturbing magnitudes worldwide and it is not showing signs of slowing down. As of March 2013, the World Health Organization (WHO) estimates that 347 million people worldwide have diabetes (WHO, Diabetes Fact Sheet Nº 312). The WHO also projects that diabetes deaths will double between the years 2005 and 2030. Most alarming is that such projections come despite ongoing research efforts in diabetes and associated complications. The challenge in addressing this global health problem is contributed to in part by lack of complete understanding of the mechanisms underlying diabetes pathogenesis. We believe that our incomplete understanding of diabetes is primarily limited by two aspects: 1) technical limitations in studying pancreatic islets in a more physiologically relevant context; and 2) inherent differences in some structural and critical functional aspects of mouse and human islets that lead to inconsistencies in experimental outcomes. Therefore, experimental findings in mouse islets should not always be assumed to be the same in human islets, and caution should be advised against straight forward extrapolation of such findings to the human setting 83 , 84. Thanks to studies in rodent islets, there exists an inordinate wealth of knowledge about islet biology, but emerging evidence showing unique features of the human pancreatic islet emphasize the need to conduct studies using human tissue to further validate findings in mouse islets and improve translational outcomes. In keeping with this notion, we have conducted studies using human pancreatic tissue and were able to confirm similar as well as distinctive features of human islets in comparison with mouse islets 85 , 86 , 87 , 88 , 89. Our studies, for instance, on the role of glutamate signaling in islet function revealed similar autocrine effects in human and mouse islets 90. And intravital demonstration of the glutamate positive autocrine effects on the function of alpha cell would not have been possible without the use of mice. Importantly, such intravital studies can provide preclinical evidence in support of human clinical trials with approved drugs. Therefore, animal models will likely endure and continue to enrich our knowledge about different aspects of the pancreatic islet biology in health and disease. More comprehensive discussion of this topic can be found in an editorial published in Nature Medicine 91. Animal models are particularly valuable to study pancreatic islets in the physiologically relevant context of the in vivo environment. Isolated human islets can be transplanted into immune compromised mice without risk of rejection to study human islet biology under different conditions 92 , 93. Also, we have recently demonstrated that transplantation of pancreatic islets into the anterior chamber of the mouse eye recapitulates the anatomical and functional features of islets in the native pancreas 94 , 95 , 96. Importantly, human islets can also be transplanted into the anterior chamber of the eye 97 to capitalize on its technical advantages that enable non-invasive and longitudinal interrogation of the islets at the single cell level 98 , 99. This is especially important to study human islets in the context of unique characteristics not available in mouse islets. In conclusion, intravital imaging has emerged as an indispensable tool in biomedical research. It has helped reveal biological phenomena not predicted by in vitro or ex vivo studies. This is primarily due to the inherent fact that certain essential components (e.g., innervation, vasculature, immune system, etc.) of the natural in vivo environment that contribute significantly to disease development are missing or incomplete in these settings. Therefore, future intravital studies capitalizing on the advantages offered by in vivo approaches such as intraocular islet transplantation to investigate human islets will undoubtedly contribute to our improved understanding of the pathogenesis of human diabetes and its associated life-threatening complications 100. We would like to acknowledge the instrumental contributions of Drs. Carol Jacques-Silva, Over Cabrera, Judith Molina, and Rayner Rodriguez-Diaz which have helped uncover the unique structural and functional aspects of the human pancreatic islet. Funding for the research studies behind this work was provided by the Diabetes Research Institute Foundation and grants from the National Institute of Health (NIH) through the National Institute of Digestive and Kidney Disease (NIDDK) (F32DK083226, U01DK089538, R56DK084321, R01DK084321, and R03DK075487), the JDRFI (4-2004-361). Additional research support was provided through funds from Karolinska Institutet, the Swedish Research Council, the Swedish Diabetes Foundation, the Family Erling-Persson Foundation, the Family Knut and Alice Wallenberg Foundation, the Skandia Insurance Company Ltd., VIBRANT (FP7-228933-2), Strategic Research Program in Diabetes at Karolinska Institutet, the Novo Nordisk Foundation, the Stichting af Jochnick Foundation, and the Berth von Kantzow’s Foundation. P-OB is co-founder and CEO of BioCrine AB who is using the anterior chamber of the eye in vivo imaging platform for commercial purposes. MHA is consultant to BioCrine AB. AC is co-inventor on patents held by BioCrine AB. Gilbert ER, Liu D. Epigenetics: the missing link to understanding beta-cell dysfunction in the pathogenesis of type 2 diabetes. Epigenetics 2012; 7: 841-852. Fink RI, Kolterman OG, Griffin J, Olefsky JM Mechanisms of insulin resistance in aging. J Clin Invest 1983; 71: 1523-1535. Prescher A, Mory C, Martin M, Fiedler M, Uhlmann D. Effect of FTY720 treatment on postischemic pancreatic microhemodynamics. Transplant Proc 2010; 42: 3984-3985. 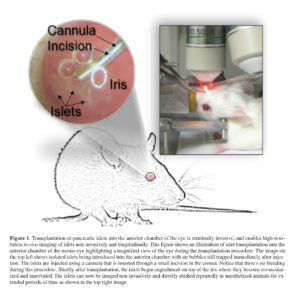 Leblond F, Davis S, Valdés P, Pogue B. Pre-clinical whole-body fluorescence imaging: Review of instruments, methods and applications. J Photochem Photobiol B 2010; 98: 77-94. Toso C, Vallee JP, Morel P, Ris F, Demuylder-Mischler S, Lepetit-Coiffe M, Marangon N, Saudek F, James Shapiro AM, Bosco D, Berney T. Clinical magnetic resonance imaging of pancreatic islet grafts after iron nanoparticle labeling. Am J Transplant 2008; 8: 701-706. Di Gialleonardo V, de Vries EF, Di Girolamo M, Quintero AM, Dierckx RA, Signore A. Imaging of beta-cell mass and insulitis in insulin-dependent (Type 1) diabetes mellitus. Endocr Rev 2012; 33: 892-919. Ntziachristos V. Going deeper than microscopy: the optical imaging frontier in biology. Nat Methods 2010; 7: 603-614. Denk W, Strickler JH, Webb WW. Two-photon laser scanning fluorescence microscopy. Science 1990; 248: 73-76. Camirand G. New perspectives in transplantation through intravital microscopy imaging. Curr Opin Organ Transplant 2013; 18: 6-12. Fan Z, Spencer JA, Lu Y, Pitsillides CM, Singh G, Kim P, Yun SH, Toxavidis V, Strom TB, Lin CP, Koulmanda M. In vivo tracking of ‘color-coded’ effector, natural and induced regulatory T cells in the allograft response. Nat Med 2010; 16: 718-722. Coppieters K, Martinic MM, Kiosses WB, Amirian N, von Herrath M. A novel technique for the in vivo imaging of autoimmune diabetes development in the pancreas by two-photon microscopy. PLoS One 2010; 5: e15732. Martinic MM, von Herrath MG. Real-time imaging of the pancreas during development of diabetes. Immunol Rev 2008; 221: 200-213. Nyqvist D, Köhler M, Wahlstedt H, Berggren PO Donor islet endothelial cells participate in formation of functional vessels within pancreatic islet grafts. Diabetes 2005; 54: 2287-2293. Abdulreda MH, Faleo G, Molano RD, Lopez-Cabezas M, Molina J, Tan Y, Echeverria OA, Zahr-Akrawi E, Rodriguez-Diaz R, Edlund PK, Leibiger I, Bayer AL, Perez V, Ricordi C, Caicedo A, Pileggi A, Berggren PO. High-resolution, noninvasive longitudinal live imaging of immune responses. Proc Natl Acad Sci U S A 2011; 108, 12863-12868. Palmer GM, Fontanella AN, Shan S, Hanna G, Zhang G, Fraser CL, Dewhirst MW. In vivo optical molecular imaging and analysis in mice using dorsal window chamber models applied to hypoxia, vasculature and fluorescent reporters. Nat Protoc 2011; 6: 1355-1366. Jain RK, Munn LL, Fukumura D. Dissecting tumour pathophysiology using intravital microscopy. Nat Rev Cancer 2002; 2: 266-276. Taylor M. The response of capillary endothelium to changes in intravascular pressure, as seen in the rabbit’s ear chamber. Aust J Exp Biol Med Sci 1953; 31, 533-543. Shan S, Sorg B, Dewhirst MW. A novel rodent mammary window of orthotopic breast cancer for intravital microscopy. Microvasc Res 2003; 65: 109-117. Speier S, Nyqvist D, Cabrera O, Yu J, Molano RD, Pileggi A, Moede T, Köhler M, Wilbertz J, Leibiger B, Ricordi C, Leibiger IB, Caicedo A, Berggren PO. Noninvasive in vivo imaging of pancreatic islet cell biology. Nat Med 2008; 14: 574-578. Speier S, Nyqvist D, Köhler M, Caicedo A, Leibiger IB, Berggren PO. Noninvasive high-resolution in vivo imaging of cell biology in the anterior chamber of the mouse eye. Nat Protoc 2008; 3: 1278-1286 (2008). Leibiger IB, Caicedo A, Berggren PO. Non-invasive in vivo imaging of pancreatic beta-cell function and survival–a perspective. Acta Physiol (Oxf) 2012; 204: 178-185. Rodriguez-Diaz R, Speier S, Molano RD, Formoso A, Gans I, Abdulreda MH, Cabrera O, Molina J, Fachado A, Ricordi C, Leibiger I, Pileggi A, Berggren PO, Caicedo A. Noninvasive in vivo model demonstrating the effects of autonomic innervation on pancreatic islet function. Proc Natl Acad Sci U S A 2012; 109: 21456-21461. Abdulreda MH, Caicedo A, Berggren PO. Transplantation into the anterior chamber of the eye for longitudinal, non-invasive in vivo imaging with single-cell resolution in real-time. J Vis Exp 2013; (73): e50466. Biros D. Anterior chamber-associated immune deviation. Vet Clin North Am Small Anim Pract 2008; 38: 309-321. Streilein J, Niederkorn J. Characterization of the suppressor cell(s) responsible for anterior chamber-associated immune deviation (ACAID) induced in BALB/c mice by P815 cells. J Immunol 1985; 134: 1381-1387. Streilein J. Anterior chamber associated immune deviation: the privilege of immunity in the eye. Surv Ophthalmol 1990; 35: 67-73. Perez VL, Caicedo A, Berman DM, Arrieta E, Abdulreda MH, Rodriguez-Diaz R, Pileggi A, Hernandez E, Dubovy SR, Parel JM, Ricordi C, Kenyon NM, Kenyon NS, Berggren PO. The anterior chamber of the eye as a clinical transplantation site for the treatment of diabetes: a study in a baboon model of diabetes. Diabetologia 2011; 54: 1121-1126. Adeghate E, Donath T. Morphological findings in long-term pancreatic tissue transplants in the anterior eye chamber of rats. Pancreas 1990; 5: 298-305. Bando Y, Ksander B, Streilein J. Characterization of specific T helper cell activity in mice bearing alloantigenic tumors in the anterior chamber of the eye. Eur J Immunol 19901; 21: 1923-1931. Bickford-Wimer P, Granholm AC, Bygdeman M, Hoffer B, Olson L, Seiger A, Strömberg I. Human fetal cerebellar and cortical tissue transplanted to the anterior eye chamber of athymic rats: electrophysiological and structural studies. Proc Natl Acad Sci U S A 1987; 84: 5957-5961. Rodriguez R, Molano RD, C. Ricordi C, Berggren P-O, Pileggi A, Caicedo A. The anterior chamber of the eye as a platform to study human islet cell biology in vivo. Am J Transplant 2009; 9(S2): 725. Brissova M, Fowler MJ, Nicholson WE, Chu A, Hirshberg B, Harlan DM, Powers AC. Assessment of human pancreatic islet architecture and composition by laser scanning confocal microscopy. J Histochem Cytochem 2005; 53: 1087-1097. Cabrera O, Berman DM, Kenyon NS, Ricordi C, Berggren PO, Caicedo A. The unique cytoarchitecture of human pancreatic islets has implications for islet cell function. Proc Natl Acad Sci U S A 2006; 103: 2334-2339. Bonner-Weir S, Orci L. New perspectives on the microvasculature of the islets of Langerhans in the rat. Diabetes 1982; 31: 883-889. Stagner JI, Samols E. The vascular order of islet cellular perfusion in the human pancreas. Diabetes 1992; 41: 93-97. Brunicardi FC, Stagner J, Bonner-Weir S, Wayland H, Kleinman R, Livingston E, Guth P, Menger M, McCuskey R, Intaglietta M, Charles A, Ashley S, Cheung A, Ipp E, Gilman S, Howard T, Passaro E Jr. Microcirculation of the islets of Langerhans. Long Beach Veterans Administration Regional Medical Education Center Symposium. Diabetes 1996; 45: 385-392. Ravier MA, Güldenagel M, Charollais A, Gjinovci A, Caille D, Söhl G, Wollheim CB, Willecke K, Henquin JC, Meda P. Loss of connexin36 channels alters beta-cell coupling, islet synchronization of glucose-induced Ca2+ and insulin oscillations, and basal insulin release. Diabetes 2005; 54: 1798-1807. Serre-Beinier V, Bosco D, Zulianello L, Charollais A, Caille D, Charpantier E, Gauthier BR, Diaferia GR, Giepmans BN, Lupi R, Marchetti P, Deng S, Buhler L, Berney T, Cirulli V, Meda P. Cx36 makes channels coupling human pancreatic beta-cells, and correlates with insulin expression. Hum Mol Genet 2009; 18: 428-439. Cabrera O, Jacques-Silva MC, Speier S, Yang SN, Köhler M, Fachado A, Vieira E, Zierath JR, Kibbey R, Berman DM, Kenyon NS, Ricordi C, Caicedo A, Berggren PO. Glutamate is a positive autocrine signal for glucagon release. Cell Metab 2008; 7: 545-554. Moriyama Y, Hayashi M. Glutamate-mediated signaling in the islets of Langerhans: a thread entangled. Trends Pharmacol Sci 2003; 24: 511-517. Bertrand G, Gross R, Puech R, Loubatières-Mariani MM, Bockaert J. Glutamate stimulates glucagon secretion via an excitatory amino acid receptor of the AMPA subtype in rat pancreas. Eur J Pharmacol 1993; 237: 45-50. Petit P, Hillaire-Buys D, Manteghetti M, Debrus S, Chapal J, Loubatières-Mariani MM. Evidence for two different types of P2 receptors stimulating insulin secretion from pancreatic B cell. Br J Pharmacol 1998; 125: 1368-1374. Salehi A, Qader SS, Grapengiesser E, Hellman B. Inhibition of purinoceptors amplifies glucose-stimulated insulin release with removal of its pulsatility. Diabetes 2005; 54: 2126-2131. Léon C, Freund M, Latchoumanin O, Farret A, Petit P, Cazenave JP, Gachet C. The P2Y(1) receptor is involved in the maintenance of glucose homeostasis and in insulin secretion in mice. Purinergic Signal 2005; 1: 145-151. Fernandez-Alvarez J, Hillaire-Buys D, Loubatières-Mariani MM, Gomis R, Petit P. P2 receptor agonists stimulate insulin release from human pancreatic islets. Pancreas 2001; 22: 69-71. Silva AM, Rodrigues RJ, Tomé AR, Cunha RA, Misler S, Rosário LM, Santos RM. Electrophysiological and immunocytochemical evidence for P2X purinergic receptors in pancreatic beta cells. Pancreas 2008; 36: 279-283. Jacques-Silva MC, Correa-Medina M, Cabrera O, Rodriguez-Diaz R, Makeeva N, Fachado A, Diez J, Berman DM, Kenyon NS, Ricordi C, Pileggi A, Molano RD, Berggren PO, Caicedo A. ATP-gated P2X3 receptors constitute a positive autocrine signal for insulin release in the human pancreatic beta cell. Proc Natl Acad Sci U S A 2010; 107: 6465-6470. Hanna ST, Pigeau GM, Galvanovskis J, Clark A, Rorsman P, MacDonald PE. Kiss-and-run exocytosis and fusion pores of secretory vesicles in human beta-cells. Pflugers Arch 2009; 457: 1343-1350. MacDonald PE, Braun M, Galvanovskis J, Rorsman P. Release of small transmitters through kiss-and-run fusion pores in rat pancreatic beta cells. Cell Metab 2006; 4: 283-290. Woods S, Porte DJ, Neural control of the endocrine pancreas. Physiol Rev 1974; 54: 596-619. Rodriguez-Diaz R, Caicedo A Novel approaches to studying the role of innervation in the biology of pancreatic islets. Endocrinol Metab Clin North Am 2013; 42: 39-56. Ahrén B. Autonomic regulation of islet hormone secretion—implications for health and disease. Diabetologia 2000; 43: 393-410. Lindskog S, Ahrén B, Dunning B, undler F. Galanin-immunoreactive nerves in the mouse and rat pancreas. Cell Tissue Res 1991; 264: 363-368. Karlsson S, Sundler F, Ahrén B Neonatal capsaicin-treatment in mice: effects on pancreatic peptidergic nerves and 2-deoxy-D-glucose-induced insulin and glucagon secretion. J Auton Nerv Syst 1992; 39: 51-59. Ahrén B, Ar’Rajab A, Böttcher G, Sundler F, Dunning BE. Presence of galanin in human pancreatic nerves and inhibition of insulin secretion from isolated human islets. Cell Tissue Res 1991; 264: 263-267. Bishop AE, Polak JM, Green IC, Bryant MG, Bloom SR. The location of VIP in the pancreas of man and rat. Diabetologia 1980; 18: 73-78. Ding WG, Kimura H, Fujimura M, Fujimiya M. Neuropeptide Y and peptide YY immunoreactivities in the pancreas of various vertebrates. Peptides 1997; 18: 1523-1529. Rodriguez-Diaz R, Abdulreda MH, Formoso AL, Gans I, Ricordi C, Berggren PO, Caicedo A. Innervation patterns of autonomic axons in the human endocrine pancreas. Cell Metab 2011; 14: 45-54. Gautam D, Jeon J, Li JH, Han SJ, Hamdan FF, Cui Y, Lu H, Deng C, Gavrilova O, Wess J. Metabolic roles of the M3 muscarinic acetylcholine receptor studied with M3 receptor mutant mice: a review. J Recept Signal Transduct Res 2008; 28: 93-108. Gilon P, Henquin J Mechanisms and physiological significance of the cholinergic control of pancreatic beta-cell function. Endocr Rev 2001; 22: 565-604. Barker CJ, Berggren PO. New horizons in cellular regulation by inositol polyphosphates: insights from the pancreatic beta-cell. Pharmacol Rev 2013; 65: 641-669. Healy JA, Nilsson KR, Hohmeier HE, Berglund J, Davis J, Hoffman J, Kohler M, Li LS, Berggren PO, Newgard CB, Bennett V. Cholinergic augmentation of insulin release requires ankyrin-B. Sci Signal 2010; 3: ra19. Ahrén B. Regulation of insulin secretion by nerves and neuropeptides. Ann Acad Med Singapore 1999; 28: 99-104. D’Alessio DA, Kieffer TJ, Taborsky GJ Jr, Havel PJ. Activation of the parasympathetic nervous system is necessary for normal meal-induced insulin secretion in rhesus macaques. J Clin Endocrinol Metab 2001; 86: 1253-1259. Ahrén B, Holst J. The cephalic insulin response to meal ingestion in humans is dependent on both cholinergic and noncholinergic mechanisms and is important for postprandial glycemia. Diabetes 2001; 50: 1030-1038. Teff KL, Mattes RD, Engelman K. Cephalic phase insulin release in normal weight males: verification and reliability. Am J Physiol 1991; 261: E430-436. Chenon D, Ribes G, Loubatières-Mariani M. [Importance of the cholinergic nervous system in the postprandial secretion of insulin in dogs]. C R Seances Soc Biol Fil 1984; 178: 307-312. Rodriguez-Diaz R, Dando R, Huang YA, Berggren PO, Roper SD, Caicedo A. Real-time detection of acetylcholine release from the human endocrine pancreas. Nat Protoc 2012; 7: 1015-1023. Rodriguez-Diaz R, Dando R, Jacques-Silva MC, Fachado A, Molina J, Abdulreda MH, Ricordi C, Roper SD, Berggren PO, Caicedo A. Alpha cells secrete acetylcholine as a non-neuronal paracrine signal priming beta cell function in humans. Nat Med 2011; 17: 888-892. Seok J, Warren HS, Cuenca AG, Mindrinos MN, Baker HV, Xu W, Richards DR, McDonald-Smith GP, Gao H, Hennessy L, Finnerty CC, López CM, Honari S, Moore EE, Minei JP, Cuschieri J, Bankey PE, Johnson JL, Sperry J, Nathens AB, Billiar TR, West MA, Jeschke MG, Klein MB, Gamelli RL, Gibran NS, Brownstein BH, Miller-Graziano C, Calvano SE, Mason PH, Cobb JP, Rahme LG, Lowry SF, Maier RV, Moldawer LL, Herndon DN, Davis RW, Xiao W, Tompkins RG; Inflammation and Host Response to Injury, Large Scale Collaborative Research Program. Genomic responses in mouse models poorly mimic human inflammatory diseases. Proc Natl Acad Sci U S A 2013; 110: 3507-3512. No authors listed. Of men, not mice. Nat Med 2013; 19: 379-379. Greiner DL, Brehm MA, Hosur V, Harlan DM, Powers AC, Shultz LD. Humanized mice for the study of type 1 and type 2 diabetes. Ann N Y Acad Sci 2011; 1245: 55-58. Brehm MA, Powers AC, Shultz LD, Greiner DL. Advancing animal models of human type 1 diabetes by engraftment of functional human tissues in immunodeficient mice. Cold Spring Harb Perspect Med 2012; 2: a007757. Nyqvist D, Speier S, Rodriguez-Diaz R, Molano RD, Lipovsek S, Rupnik M, Dicker A, Ilegems E, Zahr-Akrawi E, Molina J, Lopez-Cabeza M, Villate S, Abdulreda MH, Ricordi C, Caicedo A, Pileggi A, Berggren PO. Donor islet endothelial cells in pancreatic islet revascularization. Diabetes 2011; 60: 2571-2577. Kistler AD, Caicedo A, Abdulreda MH, Yoo T, Kerjaschki D, Quaggin SE, Berggren PO, Reiser J, Fornoni A. An eye-catching view of the glomerulus: non-invasive imaging of glomeruli transplanted into the anterior chamber of the mouse eye. J Am Soc Nephrol 2012; 23: 84A.